Sale is online today only, so don't procrastinate! 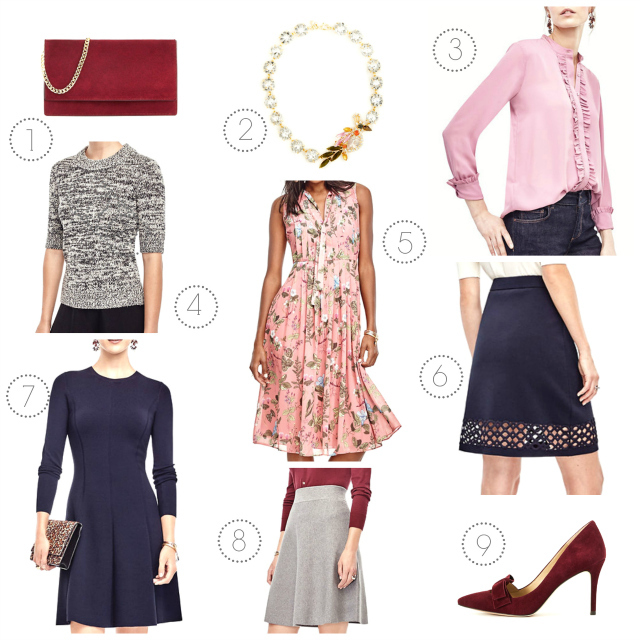 With Ann Taylor's recent launch of beautiful, new arrivals, it made it extremely difficult for me to narrow down my top picks, but I culled through tons of items and rounded up all of my favorites for you. Just click on any of the numbers above to shop the items in the collage, or scroll down for more of my picks by category. The Odette Suede Bow Pumps are simply gorgeous and would add the perfect feminine touch to any outfit. I'm also loving all of the marled knits and tweed offerings for Fall, especially in the soft grey tones; they're the perfect soft neutral. And, of course, the pretty, ruffled blouses always steal my heart; I can't seem to get enough of them! Which pieces are you eyeing? Have you snagged anything yet? I can tell you, sales like these don't come around very often at Ann Taylor, so take full advantage while you can!